Cheer up Auridon's locals on behalf of your "queen". Jester Queen Ayrenn has tasked me with enforcing cheer at her festivities by finding any festival goers who aren't acting the spirit of things and pelting them with flower petals. After helping Jester King Jorunn, he suggested I join the Festival of Fools in Vulkhel Guard and speak to Jester Queen Ayrenn. Talk to Jester Queen Ayrenn north of Vulkhel Guard. Pelt Grumpy Temple Stoics in Vulkhel Guard. Pelt Grumpy Residents in Skywatch. Pelt Grumpy Professors at the College of Aldmeri Propriety. Return to Jester Queen Ayrenn. Jester Queen Ayrenn has decreed happiness, but some of her subjects are being party poopers. The Queen wants you to liven up the party by throwing flowers at the grumps and the sad sacks! Your first stop is the crafting stations in Vulkhel Guard. Two Two Grumpy Temple Stoics are by the trees in front of the Mages Guild. Toss some petals at them, and travel to Skywatch. Not every resident of Skywatch is happy this season, and that's a crime! Enter the city and immediately turn right to head down the stairs into the marketplace. In front of the Enchanter's tent are two Grumpy Skywatch Residents, who are in dire need of petals! Shower them in flowers and head over to the College of Aldmeri Propriety. Some professors are in need of a pick-me-up! Head inside the college building and find two Grumpy College Professors to sprinkle with joy. There are two upstairs. On the first floor: there's one under the stairs on the left side of the building, and two on the right side near the right door. One of the right-side dwelling professors is in a room just to the left of the right-side door, so don't miss them. Once you've spread cheer throughout the island of Auridon, return to Jester Queen Ayrenn for a cheerful reward. I should find Jester Queen Ayrenn in Auridon. I should travel to the festival in Auridon and help prank people there. First, I need to locate grumps in Vulkhel Guard and toss these Petal Pelters at them. With Vulkhel Guard cheered, I now need to locate grumps in Skywatch and toss my Petal Pelters at them. 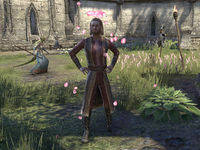 With Skywatch cheered, I only need to locate grumps in the College of Aldmeri Propriety and toss these Petal Pelters at them to fulfill my duty to Jester Queen Ayrenn. Finishes quest I have not left a single frown to be found in Auridon. I should speak to Jester Queen Ayrenn about my success. This page was last modified on 27 March 2019, at 17:08.